I took 20 minutes on Saturday to get up on the step ladder and put things where they actually belong. 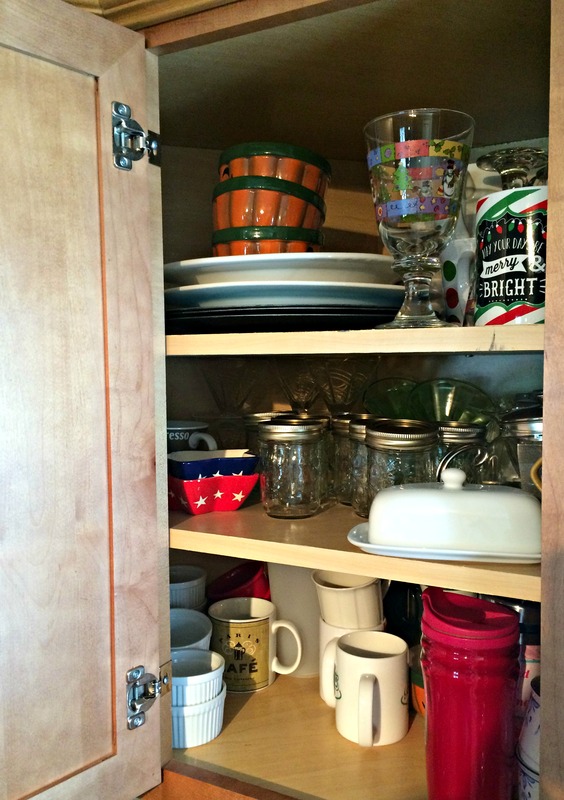 Because this cabinet is harder to access, I use it to store mostly seasonal dishes that are not being used. 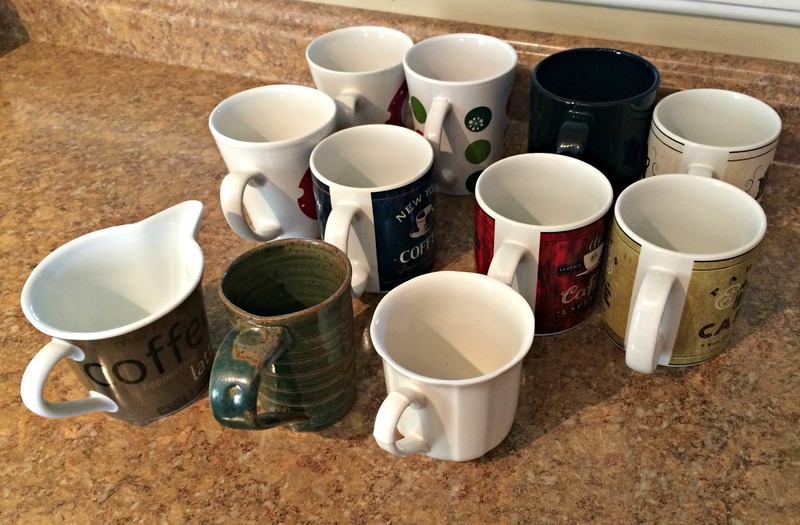 I took a few minutes to evaluate whether I needed to keep each item, and ended up with a good pile of mugs that I’m giving away (5 minutes after posting the pic on Instagram, I’d found homes for 4 of the mugs)! As with all my organizing projects, I took great pleasure in admiring my work. The “before” pictures assure me that my labor was not in vain! I left some room to grow, since I knew I had a few mugs in the dishwasher. I also noticed some water marks on the bottom shelf, probably from putting things away when they weren’t completely dry! This is the only cabinet that doesn’t have lined shelves – and that will change as soon as I find another roll that matches the rest of my shelf liner paper. 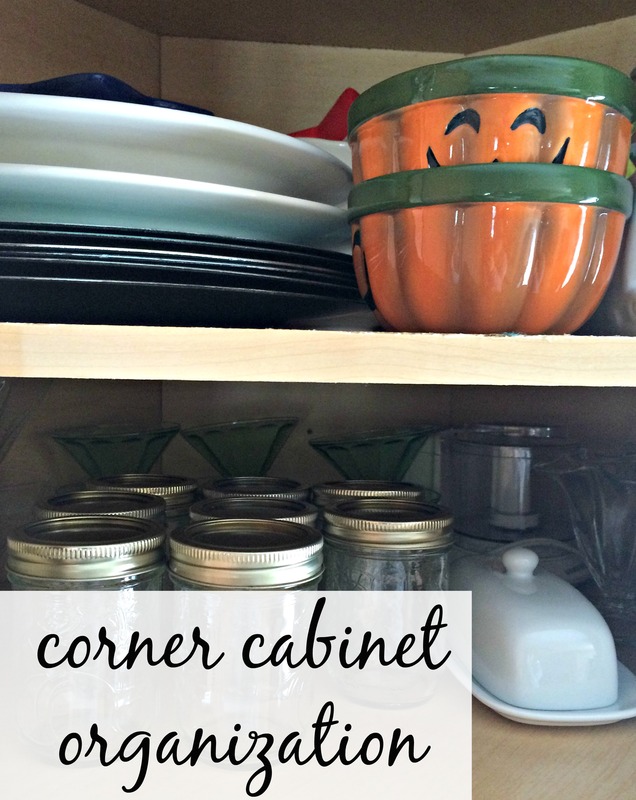 Sometimes bringing organization to a cabinet only takes a few minutes of maintenance…and I firmly believe that an organized life requires maintenance! Your organizations are always so inspiring. Our downstairs cabinets are in desperate need of it. I just popped things wherever they would fit when we moved in and that’s where they stayed. 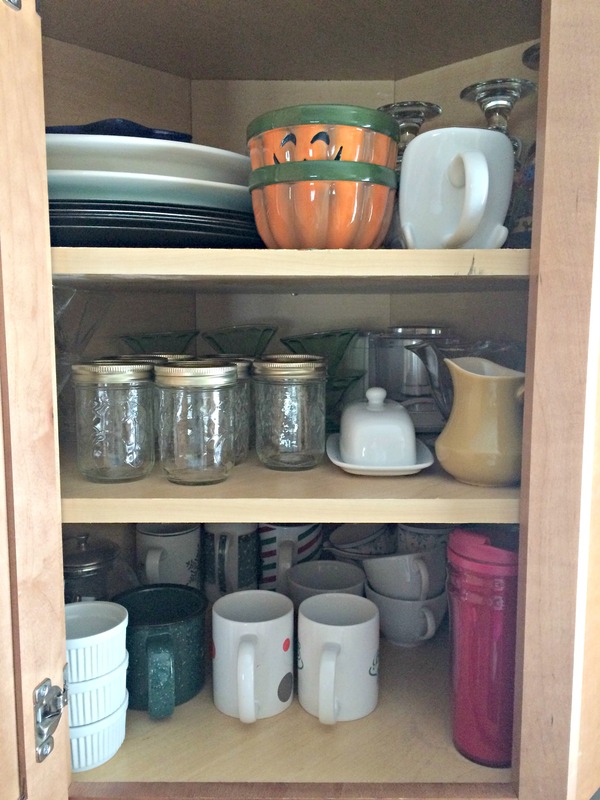 Your corner cabinet looks great – it’s a good idea to place seasonal items in the areas that are not as easily accessible! 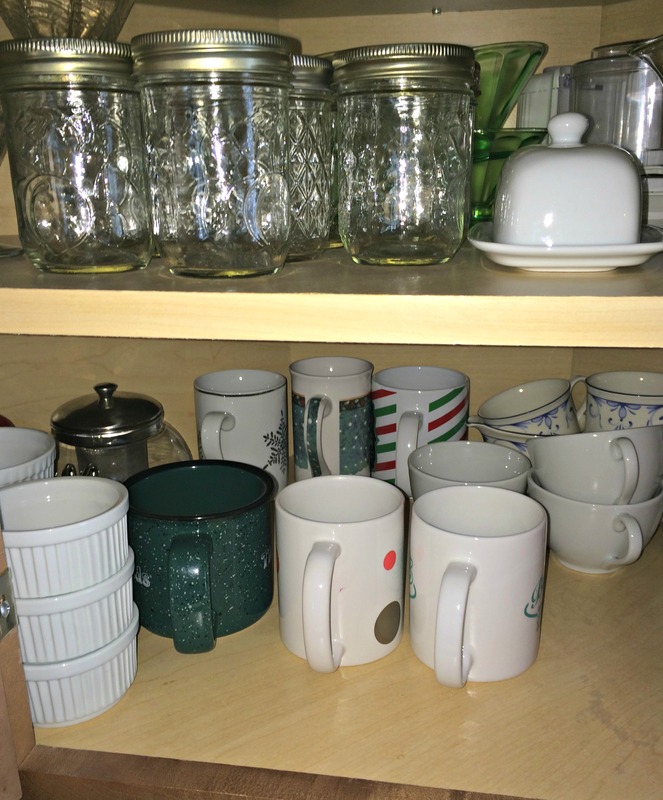 I have a bottom cabinet that is very deep, and I’ve always found it difficult to manage. I would often keep shoving things back further and further in there! However, a few months ago, I finally organized it! I placed seasonal/party items on the top shelf (it still requires taking things out to reach the back of the cabinet, but at least they are items I don’t use on a daily basis – unlike the pasta/rice/soup I previously had in there! ); and I placed a plastic bin on the bottom shelf which I can just pull out – it’s easy to grab any needed items, then slide the bin back in! Thanks, Colleen! I loved hearing about your new organization for your hard-to-access drawer! Those sneaky corner cabinets! They are hard to keep organized, for sure. Especially when they are up high like yours! Love that you tackled it in 20 minutes! I struggle with the lazy when it comes to pulling out the step stool. It’s a 10 second task, but one I ignore often! Why??? I have a similar cabinet, and I need to reevaluate putting only seasonal or rarely used items in there. Good tip! Thank you! I love those bowls too! My mom gave me those years ago and I enjoy them every fall. My corner cabinets are the bane of my existence Whitney. In our little house I plan to have deep drawers for storage and just shelves on the wall instead of upper cabinets. That will force me to keep them organized. I am 5’7″ and I still have to get out a step ladder to access my top cabinets because they are mounted on 10 walls. I would love to redesign my kitchen but I fear it is just too expensive right now. Maybe someday.